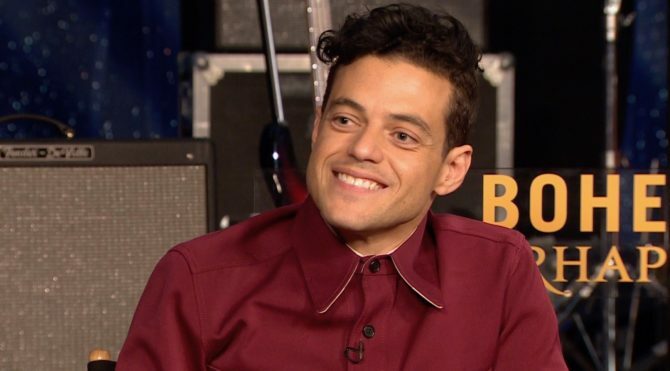 Gwilym Lee (Brian May) and Rami Malek (Freddie Mercury). Photo Credit: Alex Bailey. 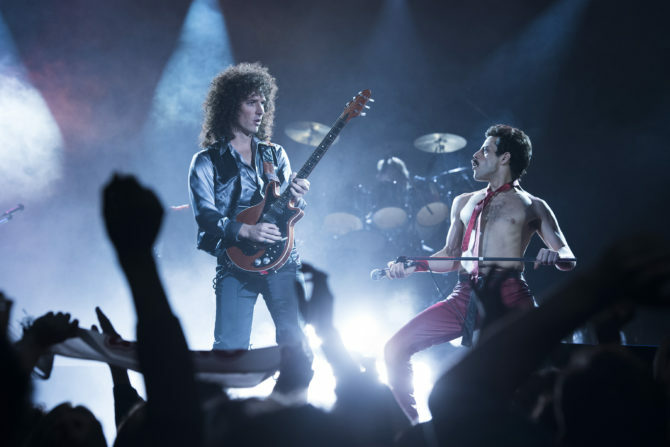 Twentieth Century Fox’s Queen biopic has been in development for nearly a decade, and for much of that time, critics, industry insiders, and rock fans alike speculated that Bohemian Rhapsody would sugar-coat Freddie Mercury’s sexuality along with his battle and eventual death from HIV and then AIDS. But the feature—hitting U.S. theaters November 2 after a late-October release in the U.K.—will indeed feature the rock/gay icon’s complicated sexuality and deadly disease front and center. And that’s a very good thing. This is my main takeaway from a media screening of 40-minutes of key scenes that were part of a press junket that spanned Los Angeles and Las Vegas last week. Without spoiling the plot, I can say also that Rami Malek (an Emmy Award winner for his work on USA Network’s Mr. Robot) fully embodies Mercury. The actor painstakingly researched the singer’s life and career through personally-funded trips to London, watching hundreds of hours of interview and concert footage, and spending quality time with founding Queen band members Brian May and Roger Taylor. So it’s no surprise that the talent Malek nails the trademark gay mustache, skin-tight jeans look of the time while mastering the outrageous stage persona as well. The film balances this personal, closed-door side of the complex rocker along with the meteoric rise of the band, including portrayals of the songwriting processes and recording sessions that gave us the rock anthems we all know and love. In Las Vegas to promote the film—and to catch Queen’s month-long residency, with equally-flamboyant singer Adam Lambert filling in for Mercury—Malek was joined by Gwilym Lee who portrays Queen guitarist May; Joseph Mazzello was plays retired bassist John Deacon; and Lucy Boynton who tackles the role of Mercury’s one-time girlfriend Mary Austin. And speaking of rock stars, the entertainment writers on the trip got a chance to discover our inner rockers, thanks to the junket. With the help of the talented folks at ‘School of Rock,’ the franchised musical instrument and singing school, I learned how to play the drums in an all-reporter band. Our lightning-fast, 10-minute lessons apparently did the trick and we jammed out “We Will Rock You,” and then were collectively humming it all damned day. Queen’s music is nothing if not earwormish. Fox flew Queerty and other media types from Los Angeles to Sin City on a chartered jet, wined and dined us, perhaps expecting this taste of the rock-and-roll lifestyle would make criticism feel sort of ungrateful. The company needn’t have worried. The short trailers we saw were engaging, and the film is polling as one of the most anticipated of the late-Fall (Oscar bait?) season. I loved the ‘Ready Freddie?’ t-shirts, but I had already been sold. But everyone can look forward to enjoying the film when it hits theaters November 2. Is this a joke? The article says…. Complicated? Really? I’m sorry but if the articles author can’t even make a statement about somebody who is #LGBT without claiming it is “Complicated” then I have no faith in their commentary saying the movie didn’t paper over Mercury’s sexuality. Mercury was married to a woman, in the mid 70s they divorced when he told her he was sleeping with men. He never dated another woman, and when he died in 1991 he had been in a live-in relationship with his boyfriend Jim Hutton for 6 years. It isn’t that complicated. He was gay or possibly Bi. Sounds pretty simple.